FINALS READY: Geelong-born Danielle Orr will play in the Cats first AFLW final this Sunday. For Geelong-born Danielle Orr, playing finals in the Cats’ inaugural AFLW team is “surreal“. The 28-year-old forward had never played football until joining the side in 2017. 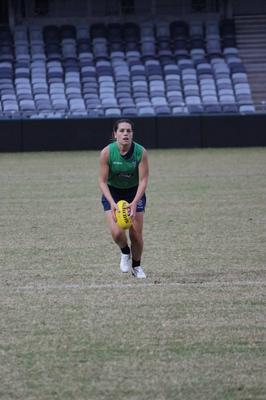 Orr gave up representative-level netball to pursue football before finishing her first VFLW season as Geelong’s second leading goal scorer. “Switching to AFL was unexpected but it was a pretty easy decision and one that I’m glad I made,” Orr told the Indy. Orr was looking forward to Geelong taking on Adelaide in their AFLW preliminary final clash on Sunday. The Cats team has embraced the finals fever and was optimistic about taking down the ladder leader, she said. Orr planned to draw on her previous finals experience from playing in last year’s VFLW grand final, she said. “Last year was a really big learning curve. Playing in the grand final was a huge moment. Representing the “Geelong community” was a big honour after living in the city her whole life, Orr said.